I’ve had a mental, wicked, and completely over the top couple of weeks. My son’s football team has started their new season and as well as ordering kit, new match balls and registering players, I’ve had welfare oficer meetings and league meetings to attend. 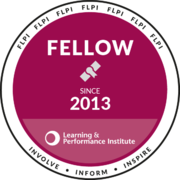 In between I’ve taken some time to collect my thoughts about Learning Live, the recent LPI event. My preference has always been to think a bit before bashing out my thoughts. There have been some excellent pieces about the event; I particularly liked Sukh Pabial’s first impressions, Craig Taylor’s live blogging, and the LearnPatch review (and not because Martin Couzins said nice things about my session). There are a few things that have bounced back at me in the last week since the event; I take these as prompts to go back through my notes of the sessions and find out which itches needed scratching. So, in no particular order, my scratching post is below. After the first 5 minutes I didn’t expect to enjoy Rob Brown’s session; indeed afterwards I had concerns I’d gone to the wrong workshop and was uncomfortable in the fact that I didn’t think I’d learnt anything. It didn’t seem to have hit the spot and I’d felt a little hard done by. Then I got an invite from someone at the event and realised that I was just not applying the ideas that he’d suggested. So I’ve added a ton of new connections on LinkedIn, joined some groups and reviewed my profile. Brown’s session above also got me thinking about networking. I’m a big fan of going where the conversation is and I realised that I need to look at the Google+ platform of conversations. I’ve extended my reach on there and have been thinking about how this could work next time. I am speaking at the 3 Learning Pool live events in October and will be looking for opportunities to create contacts and develop existing relationships. Some of Brown’s ideas about open and closed pairs in a room will be useful there. I’m supporting an event for managers on Monday and this got me thinking about the professionalism of the Learning Live event. It ran to time, was well signposted and plenty of space was made available for conversation. Excellent pre-conference activity stood out for me, especially the communications from the LPI about the sessions, how they’d run, the support available. I’ve also thought about the apparent lack of engagement with the activities that were prepared pre-event. Blog posts, videos and pre-event publication of slide decks were all used; how can we measure the effectiveness of these approaches? Is a cost benefit analysis too simplistic? I’ve had a long think about L&D in local government recently. One reason for launching #learncamp was to provide a non-threatening space where L&D peope in local government could meet . Learning Pool live will give me clues if another kind of event is needed. There is almost no need for a buyers event; I get weekly requests to attend these kind of sessions and, working in an area of decreasing budget, find them almost impossible to accept. Conferences can be a place to establishing and advising on new practice. The LGA Knowledge Hub should do this but it seems to be highly devolved with many single interest groups but many very small. Conferences do provide a great opportunity for face to face time. I think this has real value; but are people meeting like this already, off the radar, informally in small groups. This needs more thinking.